This customized Chrono Classic Watch Black Dial Black Ceramic Bezel with Stainless Steel Bracelet is water resistant to 100 meters. 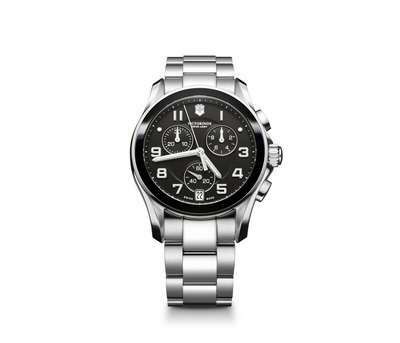 Wear a touch of class with our Chrono Classic Black Dial Black Ceramic Bezel with Stainless Steel Bracelet watch. This watch features Swiss-made stainless steel case, scratch-resistant sapphire crystal, a date window, and luminous hour & minute hands. It is water resistant to 100 meters (330 feet). With a variety of imprint options, you can create a custom product decorated with your company logo and marketing message to leave a lasting impression on recipients’ minds. This makes a wonderful giveaway for companies in the sporting goods and outdoors industry.